Jan Hommen, CEO of banking giant ING Group was hired on the back of a huge state bailout and more than a few raised eyebrows; his clear decisive behaviour however has since removed the cat from the pigeons. At the beginning of 2009 ING was in commercial meltdown. Following a period described by the company as ‘the worst quarter for equity and credit markets in more than half a century’ ING had announced losses of €3.3bn for Q4 2008 and was forced to draw on a staggering £22bn of state funding to bail out its underperforming loan portfolio. If this wasn’t bad enough, the Dutch banking and insurance giant had just announced it was to make 7,000 redundancies and would be looking to sell non-core divisions. It had also pulled the plug on its long-planned foray into the Japanese market. It was at this juncture that Jan Hommen stepped into the lions den, taking the reins from the retiring Michel Tilmant. At the time, Hommen’s appointment as the new CEO of one of the world’s largest banking and insurance groups raised a few eyebrows, as he had only been with the company for four years and his background was in heavy industry and electronics, with Alcoa and Philips Electronics, respectively. However, Hommen quickly identified where the problems were and set about his new role by adopting a three-phase approach – one that had served him well during his eight-year tenure as CFO of Philips Electronics. As he himself put it at the time: correct and strengthen the financials, reduce the number of business interests and reinforce franchises in the company’s core markets. As testament to this strategy, when he joined Philips in 1997, the group had 13 divisions, 150 businesses and almost 600 banking relationships. Five years later, the business has just five divisions, 40 businesses and 40 banking relationships, a programme that involved cutting workforces, relocating production and selling assets. Suffice to say, Hommen is not afraid to make big changes and trim the excess fat. 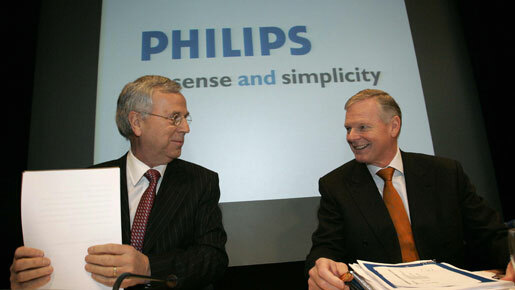 Although Philips was subsequently caught in the middle of the bursting technology bubble, delivering losses of €2.6bn in 2001, nonetheless Hommen is widely regarded as having created at Philips a stable platform for future growth, transforming the business from a complex dinosaur into a simple and well-oiled machine. In 2009, the company recorded profits of €410m. Having spent the bulk of his career in the US, he had a working understanding of the American banking model, and identified that ING had made the same mistakes as some of its trans-Atlantic colleagues. For instance, it had overstretched itself, expanding into new unchartered regions and adopting unfamiliar business models as a result of the dot.com boom. Unfortunately, it was this foray into online and telephone retail banking in overseas markets that turned out to be ING’s Achilles heel when the credit crunch bit. As he did at Philips, Hommen’s first order of business at ING was to make wholesale changes. Just one month after taking control at the top, he announced that the group would withdraw from ten of the 45 countries where it operated, with the aim of becoming – once again – a European-focused bank. It would, however, maintain a few smaller operations in strategically-important global regions. These reforms had an immediate effect on the bottom line. ING’s net loss for the last three months of 2009 was €712m, a vast improvement on the €3.71bn loss it had made in the same quarter of 2008. Furthermore, over the same period, the banking division recorded a €132m profit, compared with a €1.84bn loss for the same quarter the previous year. The group also began making inroads in the repayment of its massive debt to the government of the Netherlands, having made a one-off payment of €930m at the tail end of 2009. However, as a result of the receipt of government aid, the EU stepped into the affray, demanding that ING separates and divests its insurance operations. To this end, in November 2009 announced that, in order to satisfy the European Commission, ING would prepare for the public listing of both the European and US insurance divisions. In a further strategic move in the North American market, in the same month ING sold its 50 percent shareholding in ING Summit Industrial Fund LP, a Canada-based industrial property portfolio, to KingSett Capital, one of Canada’s leading private equity real estate investment companies, for €1.5bn. Hommen’s intention in this transaction was to reduce the group’s interests in the real estate space, which he considers to be a non-core operation. In many ways, since he returned to Europe from the US, Hommen’s career role in life has been one of fighting corporate fires and cleaning up after financial disasters. It is not, perhaps, the role he envisaged for himself, and one that has probably not won him many friends, but it is he has performed it unflinchingly and has, so far, got the right results.